I love Basic-era gaming. Basic/Expert D&D was the first D&D I ever played. Even when I had moved on to Advanced D&D, it still had a strong Basic feel to it. 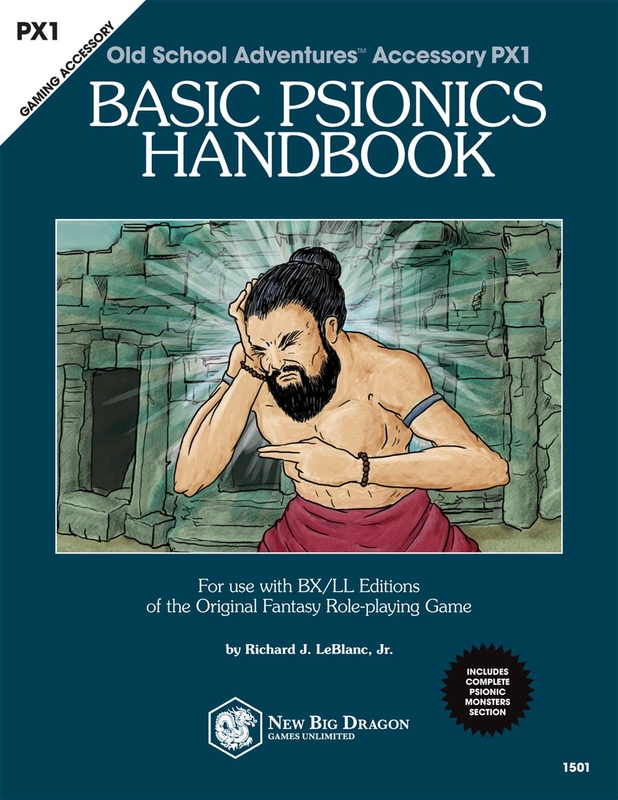 So I was very, very pleased to hear about +Richard LeBlanc's new psionics book, Basic Psionics Handbook. If you have been reading his blog, Save vs Dragon, a lot of what is in the book won't be a surprise, but it is all great stuff. Even then there are things in the book that are still a treat and a surprise. The book itself is 58 pages (PDF), full-color cover and black/white interior. The book covers two basic (and Basic) classes, the Mystic and the Monk. Both use the new psionic system presented in the book. The system bears looking at and really is a treat. Overview. This covers the basics including how psionics is not magic and how attributes are used. It's a page of rules that slot in nicely with the normal Basic rules. The basics of psychic power including Psionic Level and Psionic Strenght Points (PSP) are introduced. Mystics are next. Mystics in this case are more molded on the Eastern philosophy of mystics, not the clerical sub-class-like mystics I have detailed in the past. Though through the lens of Western thought. That's fine this is not a religious analysis, this is a game book. This class helps builds the psionic system used in this book based on the seven chakras. Chakras divide the psionic powers into broad groups; something like the schools of magic for spells. As the mystic progresses in level, they open up more and more chakras. Each chakra has seven Major Sciences and twelve Minor Devotions, similar to the old AD&D rules (but not exactly the same, so read carefully). This gives us 72 devotions and 42 sciences. That's quite a lot really. As the mystic progresses they also earn more PSPs and more attack and defense modes. They are the heavy hitters of the psionic game. Monks are the next class. Monks really are more of psionic using class in my mind and to have them here next to the mystic is a nice treat for a change. Everything you expect from the monk is here. Unarmed attacks, no need for armor and lots of fun psionic based combat powers. The monk does not have the psionic power the mystic does, but that is fine it is not supposed to. It does have a some neat powers from the mystic's list. One can easily see a monastery where both mystics and monks train together, one more mental and the other more physical. The monk has plenty of customization options in terms of choice of powers. In truth it is a very elegant system that shows it's strength with the mystic and it's flexibility with the example of the monk. This is very likely my favorite monk class. Psionic Disciplines detail all the powers of the chakras. It is a good bulk of the book as to be expected. There are not as many psionic powers as you might see spells in other books, but this is a feature, not a bug. Powers can be used many times as long as the psychic still has PSP. Also many do more things as the character goes up in level. Psionic Combat is next and deals with the five attack modes and five defense modes of psychic combat. The ten powers are detailed and an attack vs. defense matrix is also provided. The combat is simple and much improved over it's ancestors. The next large section details all the Psionic Monsters. Some of these are right out of the SRD but others are new. Personally I am rather happy to see a Psychic Vampire. Though it is not listed, I assume that these creatures are also undead and are turned as if they were vampires. Appendix A deals with something we abused the hell out of, Wild Psionics. At two pages it is the simplest set of rules I have seen for this sort of thing. Also it looks like something that could be ported into ANY version of D&D including and especially D&D 5. Get out your crystals, Appendix B details Psionic Items. Again, short, sweet and to the point. Appendix C: Psionics and Magic is a must read chapter for anyone wanting to use both in their games. Appendix D: Phrenic Creatures turns normal creatures into psionic ones. Appendix E covers Conversions for Monsters from LeBlanc's own CC1: Creature Compendium. Appendix F details how to convert any monster into a psionic one. We end with a a couple pages of collected tables and the OGL. Bottom line here is this is a great book. Everything you need to play psionic characters and add psionics to your game. Personally I am going to use this to beef up The Secret Machines of the Star Spawn which I also picked up today. Thanks for the review. Glad you like it!